In the words of one of our customers, "Peace Frogs is not icons or products, but really a state of mind." We couldn't have said it better ourselves. Peace Frogs is a full line of clothing, designed to help promote positive and optimistic thinking throughout the world. Our clothing places a premium on comfort, quality, and style, but it also allows you to spread a little bit of a positive feeling every time you wear it. Peace Frogs was originally the name chosen for a line of multi-colored international flag shorts. The frog is internationally recognized as an icon of peace and good luck and was thus deemed as an appropriate logo. The frog eventually proved so popular that the focus was shifted from the flags to the frog. 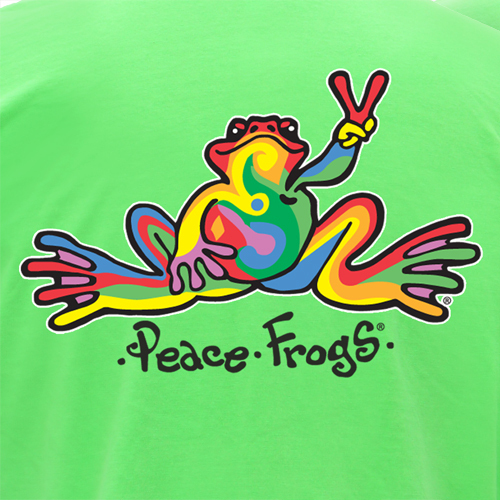 As time went on Peace Frogs expanded into t-shirts, sweatshirts, boxers, hats, and a variety of accessories. The frog's combination of positive energy, whimsical attitude, and peaceful outlook has proven universal and enduring. Over twenty-five years since its conception, Peace Frogs is still growing and now found nationally in major department stores and theme parks, as well as our own Peace Frogs stores and kiosks, mail order catalogs, and websites. Part of the Peace Frogs mindset is an awareness of our endangered environmental resources. In 2001 Peace Frogs joined with the PARC, Partners in Amphibian and Reptile Species. The immediate goal is to save the small seasonal wetlands which form the natural habitat for these creatures. Peace Frogs does not represent any form of activism; rather, we are aware that now, perhaps more than ever, our entire planet needs some positively peaceful feelings. We care about the environment, but we care about people too. Customers are always telling us stories about what Peace Frogs means to them: its more than just a piece of clothing, it's an icon of hope and happiness.